Something about the summer makes it hard to imagine preheating the oven and making your tiny apartment feel like the depths of hell. Or maybe not for you, if you can afford using your central air. But for me, a frugal fanny, summer baking is not exactly my jam. So when the drizzly Boston weather kept my Dad and I from spending a leisurely Sunday out exploring some New England farms, I knew just what I wanted to do. Yes, my long lost love of sweet cuisine was revisited, finally, after months of hiatus. What is ironic about my itch for baking was that these bars didn't require baking at all. In fact, this was one of the easiest things I've ever made. And while they are definitely satisfying for the sweetest of teeth, these little guys have no added sugar and are gluten free and vegan. (No, I'm not vegan or gluten free, and I never will be, but it's always fun to explore). What's also great about these is that you can definitely sub in ingredients you have hanging around. I'll post the recipe we used, but also some alternatives for you. 2. Place oats into 350 degree preheated oven and toast until golden brown. 3. Place oats, apricots, sunflower seeds and coconut in a large mixing bowl. 4. In a small sauce pan over low heat, combine peanut butter and maple syrup and mix until well combined and warmed. Pour over oat mixture and mix thoroughly. 5. Transfer to a 9x9 parchment lined pan and sprinkle coarse sea salt over the mixture. Press firmly down until flattened. 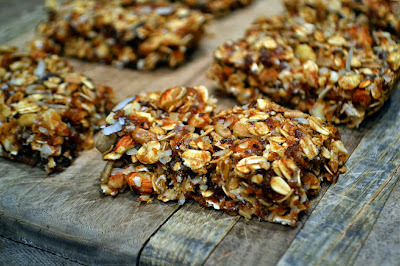 Place in refrigerator or freezer until chilled, and then cut into 10-12 bars.